Tintin Heart: Big Birthday Bash at Cards Galore- Let's Celebrate! Big Birthday Bash at Cards Galore- Let's Celebrate! Pop over to the Cards Galore Challenge Blog and check out the other DT examples. Great ideas and inspiration. 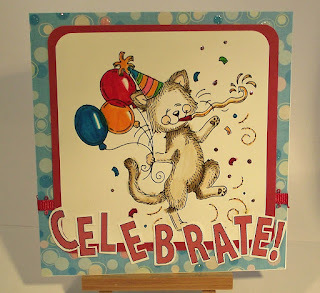 My Cards Galore DT card has a digi image from Meljen Designs of a very happy cat celebrating in style. The coloured image was matted onto some red cardstock and then onto a cardbase covered with backing-paper with a dots and glitter pattern. A thin band of red ribbon from my stash helps to anchor the image to the base of the square card. I used my computer the print out the lettering for the sentiment CELEBRATE and cut them out by hand. Some Ranger Sparkles dotted here and there finish the card. Cute! Thanks for taking the time to stop by to read my blog. I appreciate your time and comments. White and Red cardstock and Ribbon from stash.